THE QUEEN'S ACCOMPLICE, book #6 in the Maggie Hope series, comes out on October 4th—just three weeks away! So I'm busily approving press materials, and writing blog posts and articles to support the launch. And I have a book tour coming up. Do I know where I'm going? 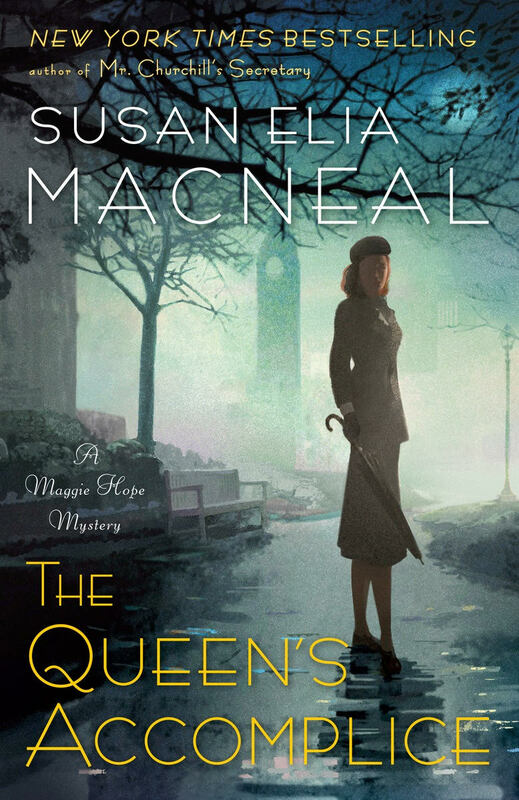 And then, on top of that, THE PARIS SPY, book #7 in the Maggie Hope series, is due October 15, ONE MONTH AWAY! Is it done? I've given Noel pages to read and edit. He's returned them to me, marked up with blue pencil. "I'm ready for more pages!" says he. Me: "Um, that's great — but they don't exist yet." I'm at Bouchercon! Yes, it's great! I love seeing people! It's NOLA for heaven's sake! But it's not conducive to writing. AND it's hubby's birthday TODAY! I'm missing my husband's birthday. Yes, we will celebrate when I get home. But still. I'm having All the Guilts. Also, I'm at Bouchercon and it's Kiddo's second week at his new middle school. He is having the expected growing pains. AND I'M NOT THERE! BAD MOMMY! 100 MOMMY DEMERITS! 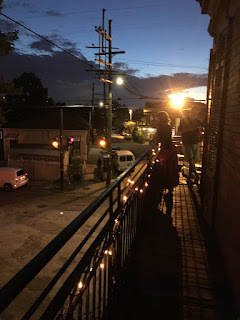 This is the balcony of the amazing New Orleans restaurant where I phoned home last night to talk to Noel and Kiddo. They were fine. I was a mess. So I'm trying to write something for you guys, something amazing and inspiring and enticing.... and, well, drawing a blank. I'm thinking about my husband and kid. Thinking about the novel I'm supposed to write. Thinking about the novel coming out. Thinking about where I may or may not be going on tour. And that, folks, is my post. I love you all, but I have to go back to work. P.S. Does anyone remember the Dunkin' Donuts commercial with the guy saying, "Time to make the donuts"? (You can see it here.) Well, time to make the books. SUSAN ELIA MACNEAL: So, Reds and lovely readers—what's your favorite donut? And I can bring my laptop, yes? I hope you have a wonderful time at Bouchercon . . . loved the views from your room and the restaurant --- such a beautiful place. And, yes, definitely try a beignet --- they’re amazing. Ah, doughnuts. Apple cider doughnuts are the hands-down family favorite, but chocolate cake/chocolate frosted is extremely difficult to pass up. When the children were small, we used to get chocolate cream filled doughnuts at Dunkin’ Donuts . . . yum! My favorite doughnut is Boston creme... with that custard mmmm. Wish you were coming to the Tucson Festival of Books. It's huge. What fun, Susan. Have a great time at B'con, you know the book will be fine. Doughnuts...I'm with Reine - Boston creme-I don't remember the last time I let myself have one! I haven't had a Boston cream donut since I left Boston several years ago. I would move back just for the donuts. No Dunkies out here! The three of us could do the rest of this blog on donuts while the Reds are at B'con. Ha ha. I am looking forward to reading Book 6. I have it on order at my library, 9 folks ahead of me, I should get it in 18 weeks. Really good things are worth anticipating. Lie Reine, I wish part of your tour was in the South East US. I would love to meet you. ~~Maybe at Bouchercon 2018?? It will be in St. Petersburg. I wonder if it is just parents who want to be in two places at once (ambivalence). I can identify those feelings from when I traveled. Now then donuts.. Sigh my favorite is/are Safeway maple bars from the west coast. Now that I live in Florida, they remain a taste memory. I love donuts enough to not eat them, cuz can't eat just one.. Enjoy the panel tomorrow, wish I was there to hear it. Hi everyone! I'm not at Bouchercon this year so donuts for me too! I'll kill for a plain glazed donut from GLAZED DONUT in Key West! Susan, repeat after me, stay in the moment, stay in the moment! Enjoy where you are--the rest will follow in its place. Maple-iced with walnuts on top, wish I had one now! Chocolate cake donuts with good chocolate icing. Or jelly donuts with white icing. Mmm. Susan, I'll be on the lookout for you, looking forward to meeting you, and a couple others, plus seeing old friends. It's very hard to get work done at a conference, and I wish you well. Quiet rooms help. Mmmm, Beignets are much better than donuts. So exciting about the new book, travels (come to Boston!) and great reviews. I know, it does seem as if you just manage to shift one load off your plate and it starts over. A good problem to have. Hey everyone, thanks for the love and the donut shares. I'm not really a donut person (despite the post), but I used to get jelly donuts for Miss Edna, who loved them. I always preferred plain, with a strong cup of coffee. Who's at B'con? Give me a shout! I hope you enjoy Boucheron. Don't worry about everything else. Things have a way of falling into place. You're doing a wonderful job at everything. I'm eagerly awaiting THE QUEEN'S ACCOMPLICE. Mommy/wife guilt is inevitable, but don't drown in it. Enjoy yourself. I am so looking forward to the new book! I've got to stop dictating these comments. Or at least, start proofreading them more carefully. Anyway, Susan, I am on the way to the airport! Susan, I sympathize as I am in my room working when I really want to be out exploring the French Quarter and having coffee and beignets at the French Market! But I think if you can just enjoy NOLA for a few days, you'll be re-energized and your book will fall into place when you get home! Favorite donut? Um, I never eat them at home. Ever. So I think I'll go with beignets, which are definitely yummy. Maybe I'll even get to the French Market this afternoon! You must have beignets, calories or no. There is nothing in the whole wide world to rival a true New Orleans beignet! I absolutely adore Maggie, Susan, and cannot wait for the new book. I'll be on vacation when it comes out so hopefully will be able to find a bookstore. Please, please come west on your book tour. I live in Wyoming but will be delighted to drive to Denver if you come there. I drove down to see Rhys at the Tattered Cover and it was a great time. 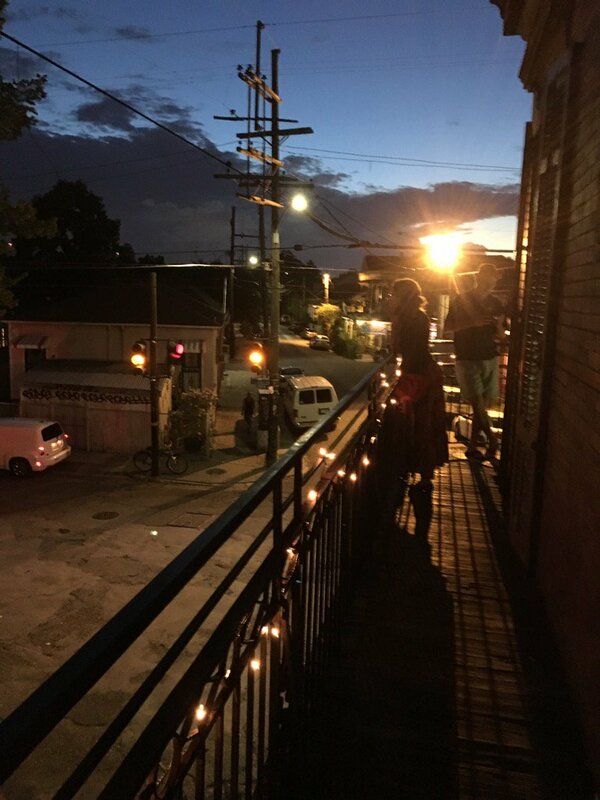 Looks like you are having a great time at B'con 2016 in New Orleans. Love the photos! Love the coffee at dunkin donuts. There is one very close to Malice in DC. Favorite donut? Whatever is the sweetest! You have to do the beignets and chicory coffee at Cafe du Monde, and I'm sure they allow laptops, except beware of the powdered sugar getting in your keyboard! Coralee, it was just my middle-of-the-night sense of humor, because for awhile we were just a few here. I love the Reds and so grateful they are here in those times when the house is dark and quiet. Reality can slip away for a little while. Here at B'con. Having fun. Will keep my eyes open for a chance to say hello. Just got back from Toronto where I somehow missed every single opportunity for my favorite available-only-in-Canada maple glazed doughnut! And with a Tim Horton on every corner,too. Sigh. But chocolate-frosted is perfect when needed, too. Whatever you do, do NOT exhale when you bite into your beignet. I still remember a friend doing that and the powdered sugar cloud that appeared. Hi Susan. Enjoy Bouchercon and NOLA. Don't worry about these deadlines...things will work out. I am definitely enjoying NOLA and Bouchercon, and the food! Yes, I had Cafe du Monde's beignets for the first time on Monday. But my favourite donut would be an apple fritter. We have them at every Tim Horton donut shop (our national bakery/donut chain). You can try a fritter in Toronto next year! To Cozy? Or Too Cozy? Jungle Red Roll Call--Count Off Now! What You Say About SAY NO MORE!